Working with the entrepreneurs we back is at the heart of our work at Balderton. Every day, we work with CEOs and their teams, weighing options on every aspect of their internal and external strategy. Many of these conversations are company-specific. But there are a number of key topics that focus on questions that every company has to answer — and topic of equity is one of those. Equity lies right at the heart of the technology ecosystem. The shared belief amongst a company’s founders, investors and employees is that they are on a path to build a rapidly growing company that will create enormous value. So it is only fair for that value to be shared amongst those who created it. And equity is the way to do that. Done well, shared equity can create life-changing moments of wealth creation for founders and employees, while delivering loyalty and a highly incentivized workforce for a company and its investors. Getting this process of value sharing just right, however, is phenomenally complex. Because we discuss the topic of equity with every single company we work with, we have built large reserves of historical data and advice in these areas. So, as we did with our Talent Ecosystem research — we occasionally release some of these in a variety of formats — from books to interactive sites, events and more. Data, insights, key learnings and worksheets on the topic of equity in European-founded startups. Why give equity to employees? 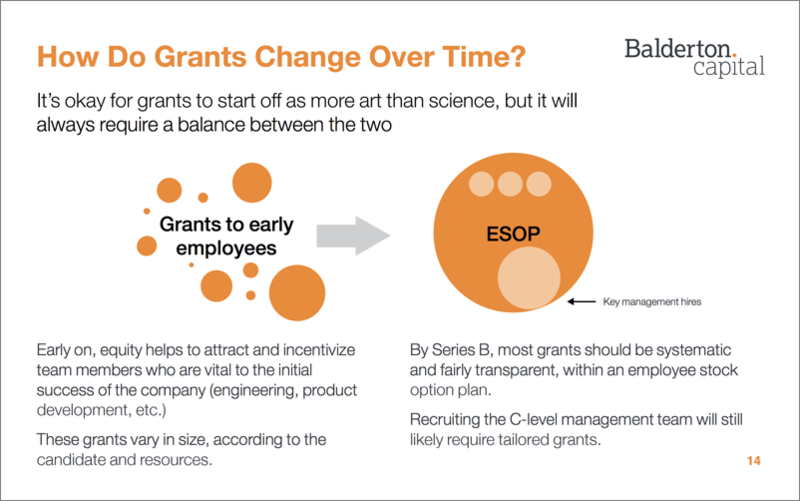 How much equity is needed for the ESOP pool and how does it evolve? 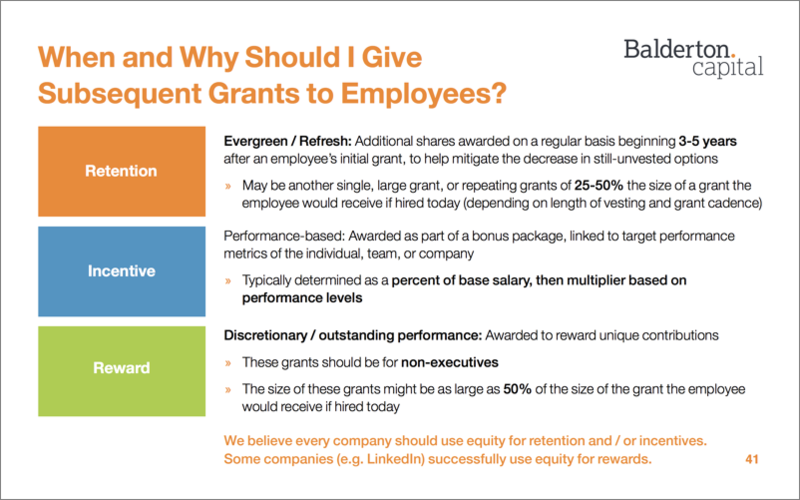 How much equity should I give an employee? How do I set a strike price for employee options? How do I help employees understand and value their equity? What are the details of vesting, exercise, and refresh? What are variations on stock options? How do I present this to my board? 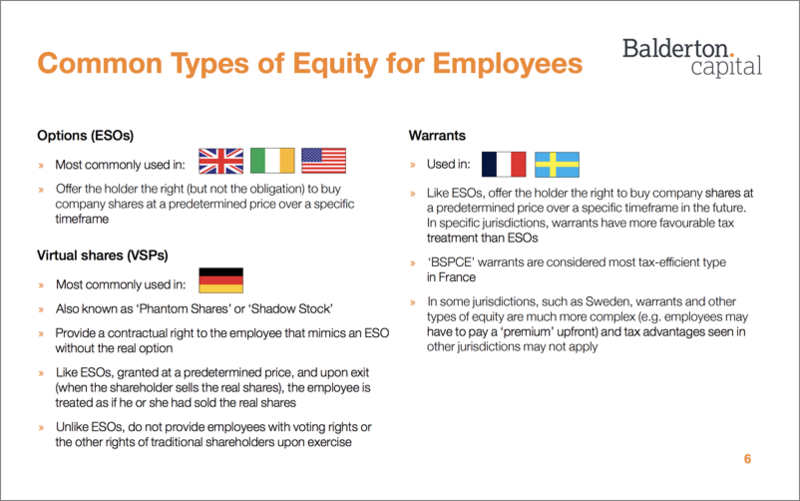 What is in the Balderton Essential Guide to Employee Equity? Common questions about equity asked by CEOs, founders and employees. A list of useful third-party resources. The Guide covers how equity practices vary across startup hubs. The Guide covers how to structure an ESOP pool and how it evolves. The Guide also looks at questions around employee vesting, exercise and refresh. Balderton has also created Google Sheets workbooks to help you better understand some of the topics discussed in the Guide. There are a huge number of resources available — but how do you know which are reliable? We have gathered a list of additional Employee Equity Resources. Google Sheets workbooks to help you better understand some of the topics discussed in the Guide. While we have started the dialogue with a large document containing everything we know on the topic we want just that: to start a dialogue. We look forward to opinions, comments and thoughts from everyone who reads this. Feel free to reach out directly to those you know at Balderton. We will incorporate your latest ideas, differences of opinion and, over time, build a living resource that will hopefully be of use to a generation of European entrepreneurs.